It’s all change for two Shropshire managers who have swapped roles at our family-owned builders’ merchants company after a total of 50 years’ combined service. 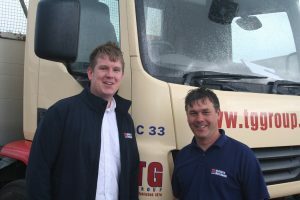 Jon Griffiths has worked for Tudor Griffiths Group for over 30 years managing several branches in the company’s builders’ merchants’ network, and Paul Morris began working for the firm by taking a Saturday job almost 20 years ago. Jon has most recently been the manager at our Oswestry branch and Paul was in charge at Ellesmere. But now Jon has moved to Ellesmere, with Paul moving in the opposite direction to lead the team at Oswestry. TG Builders’ Merchants’ Manager, Mark Evans, said: “It’s great to have such key members of our team playing these important roles in the company, as their experience is absolutely invaluable. Jon began his career with Tudor Griffiths Group as an office junior, before progressing through counter sales, working as an assistant manager at Ellesmere and Nantwich, before a seven-year spell managing the Ellesmere branch where he will now be based once again. Paul started with a Saturday job before becoming a full-time sales supervisor, and after leaving the company to work elsewhere, he returned to manage the Ellesmere branch before his latest move to Oswestry.